I do not watch much television, but when I do I usually get extremely involved in a show. My current addition is Naked and Afraid on the Discovery Channel. 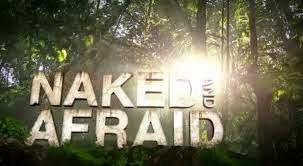 The primiss of the show is a male and female survivalists are dropped in dangerous locales like a Malaysian rain forest, an uninhibited Fiji island, Madagascar and even the Lousiana Bayou for 21 days...naked. They are challenged to find water, food and shelter with only one survival tool a piece. The catch of this show is there is no grand prize, no money, nothing! The only thing they get is a necklace that they wear during the show (I'm actually not even sure if they get to keep it). They do this for pride, to say "I did it" and to prove to themselves that they can challenge themselves beyond what they ever knew. HOW AMAZING IS THAT? I recently introduced my sister to Naked and Afraid and we discussed what an amazing psychological experience this show is and how interesting it is to see gender stereotypes take place in this extreme situation. What's really interesting is the men and women sometimes say "this is the (wo)man's role." Maybe it's a survival thing, but I don't know how much I agree with gender roles. For example, I am a female and I cannot cook so I sure hope my future husband can! Acknowledging gender stereotypes in leadership is important. On Naked and Afraid, the men are generally more physically prepared, whereas the women are emotionally and mentally more stable. While hunting, the women typically give thanks to the food they kill and get emotional over the experience and the men literally become barbaric and animalistic. The women are level headed, while the men make rash decisions. There are a few exceptions, but almost every episode has shown this relationship. Both parties are contributors to the team and each person plays a role, but I think it's very important to not discount women and what we are capable of! We are strong mentally, emotionally and physically (you should see me deadlift), we just have to be confident and have trust in ourselves and our team. I am no trained survivalist and I am way too modest to be on television in my birthday suit, but i want to experience the feeling these survivalists feel after they make it through the 21 days! 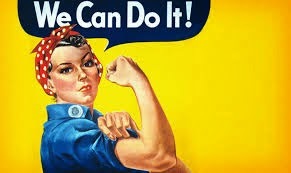 Challenge yourselves and to all my ladies...be strong gals!